Crematory is a place for cremating corpses in a furnace.As Buddhists belief of incarnations, the souls remain forever and will re-born again in a new body, while physical bodies decay by time. In a funeral, the body will be burnt, therefore, the building for Buddhist funeral needs a giant oven to complete the ceremony. 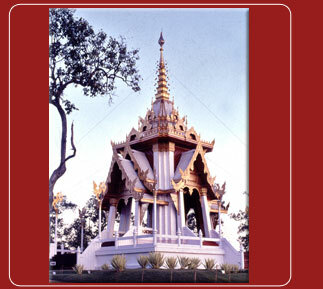 In 1984 and 1986, Thais lost their beloved and faithful monks, Master Khao Analayo and Master Van Sujino. To build a temporary crematory is a very difficult task due to the sites are in remote area and the management of the project has to be very well discipline. This is because the projects are temporary crematories and the funeral date were fixed as a deadline and can not be postpone. Therefore, the project had to be complete before the deadline but if it is finished much earlier than the schedule, the building will be damaged and ruined easily since it made of non-durable material. The process and method of both sites are quite similar, only the design and the small details of decoration are different. The design of each crematory suits each Master perfectly according to their characters. Since it was anticipated that thousand of thousand people would join the funerals, the structures of the building have to be strong enough to support numbers of people. Plywood is the main material since it is low cost and easy to work with and it is non-durable, it is suitable for these non-permanent projects. 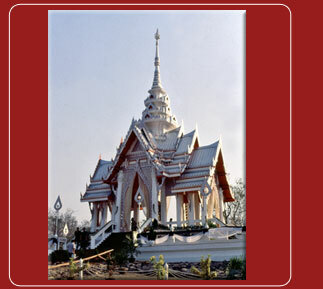 All the architectural ornaments and decoration made of double layers of stencil plywood and painted in copper red and gold colour for Master Van and the shade of white and gold for Master Khao. On the funeral days, the crematories were glowing in the dark amidst the darkness of the deep wood, impressed all the people who joined the ceremonies.